Delta and WestJet have been showing some unusually low prices from Vancouver to Phoenix and Houston throughout a large number of dates in the 2018 calendar. They are 1 stop flights through Seattle, Salt Lake City or Minneapolis. 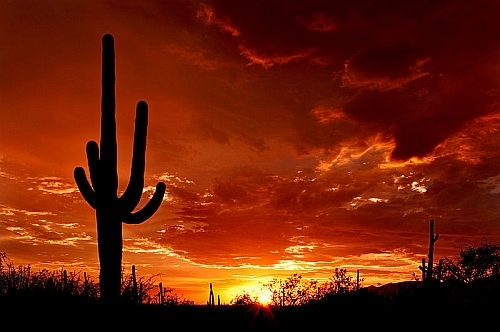 The price is unusually low, and it is available on a large number of dates, but it's also not uncommon for non-stop flights from Vancouver to Phoenix to drop into the low/mid $200s roundtrip. So a flight with 1 stop may not be worth it, unless perhaps it's over some prime dates (such as holiday weekends) that really work for you. And there are a lot of prime dates available. From Victoria, there are 1 stop flights to Los Angeles available for $157 CAD roundtrip (Victoria does not have non-stop flights to Los Angeles). And 1 stop flights from Victoria to Nashville, Tennessee for $217 CAD roundtrip. Update @ 11:40 AM PST - It looks like this may be over. The prices are still showing up, but no longer seem to be verifying on any booking sites. It's possible they were a mistake, so please don't book anything non-refundable for the next 24-48 hours (hotels, etc), to make sure the airline has issued the tickets. 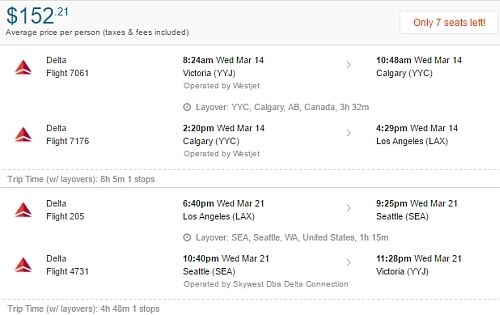 Search for a flight from Vancouver (YVR) or Victoria (YYJ) to the same destination as your Google Flights search. 2 Responses to "Victoria to Los Angeles for $153 roundtrip, and Vancouver to Phoenix or Houston for $172 CAD roundtrip including taxes"
Just booked directly on Delta Airlines website and received my confirmation email. Booked from April 13-15 with one stop in LA for $172 CDN return.